A recent study analysed the research on this topic and recommended that women should labor in whatever position they find most comfortable and not be required to lie down for long periods of time. 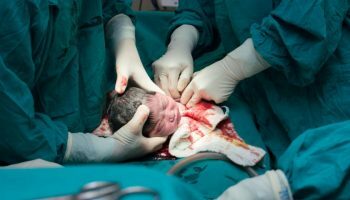 The study found that women who tended to walk or stay upright during early and active labor shaved about an hour off their labor time and were less likely to have a cesarean delivery. 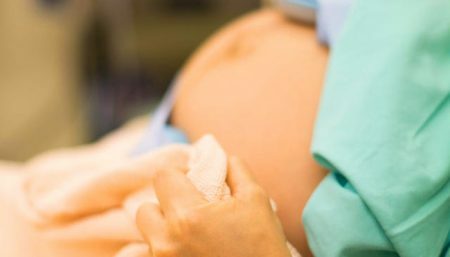 The best things to do if you want to avoid extra stress and complications when your baby is being born, is to avoid an unnecessary induction of labor. Ask for evidence or proof that the baby needs to be born right away, not just because you’ve reached your estimated due date. Seek actual test results or signs that something is not working well. Being on your back during labor and birth can cause problems too. Being stuck in bed is inevitable if you have an epidural, which is the usual next step if you have an induction with synthetic oxytocin. When you’re lying on your back, your uterus compresses major blood vessels, potentially depriving the baby of oxygen and making you dizzy or queasy. In addition, when you’re reclining, the baby’s head puts pressure on pelvic nerves in your sacrum, increasing pain during contractions. Being stuck in bed duing labor prevents movement of pelvis with an epidural, her baby doesn’t have help to move down into the most optimal position. This may result in difficulties being born, requiring forceps or vacuum, or worst case, emergency c-section. Get informed with quality, evidenced-based information, and not just what you hear from friends or family, to set yourself up for the best outcome. We research our major purchases before we buy them; we need to research major life events too. Remaining upright and leaning forward reduces the pressure, besides it allows your baby’s head to constantly bear down on your cervix. Wrap your arms around your partner’s neck or waist and sway as if you are slow dancing. This is a great position to receive a back rub. Raise one foot onto a chair or footstool and lean forward. Hold on to the back of a sturdy chair and squat. You can also squat against a wall or between your partner’s legs while he or she sits in a stable chair. Gently rock while sitting on a chair, the edge of the bed or a birthing ball. Get on all fours on the bed, a yoga mat or on the floor. Lean forward on a birthing ball, bed or partner. Have an easy & memorable childbirth.